The bots are controlled through simple eye movements. People with paralysis are finding their way back into the workforce — thanks to a four-foot-tall robot. On November 26, a pop-up cafe unlike any other opened in Tokyo, Japan. 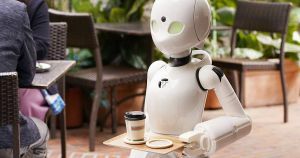 Instead of employing human waiters, or even autonomous robot waiters, this cafe features robot waiters controlled remotely by people with paralysis — a mind-bending experiment about the future of work, disability, and technology. The cafe, Dawn ver.β, is a joint venture between All Nippon Airways, the Nippon Foundation, and Ory, a Japanese robotics startup. Ory created the robots used at Dawn, which a person can instruct to move, speak, or carry objects simply by moving their eyes in certain ways. Ten paralyzed individuals each earn the equivalent of $8.80 per hour to work at Dawn through their robot avatars. Several companies contributed the funds for the project, with crowdsourcing helping to raise the rest. Dawn will close on Friday, but the people behind the robot restaurant are hopeful that a permanent version of it could open in 2020, according to Digital Trends. Even if it doesn’t, though, the project serves as a captivating case study about the ways robots could create jobs for people who might otherwise not be physically able to participate in the workforce — a particularly welcome change from all the warnings about a future plagued by robot-caused job losses.